In 2007, the Kansas City Royals traded Billy Buckner to Arizona for Alberto Callaspo. Both of those players now are with the Angels, and it's safe to say the Angels and Royals are going in two different directions. The Angels ran their winning streak to seven Saturday with their third straight win in Kansas City. Hank Conger homered for the Angels in their 7-0 win Saturday in Kansas City (Keith Allison/Creative Commons Attribution-Share Alike 2.0 Generic license). The game: May 25, Angels at Kansas City. The Angels entered 21-27, third place AL West, 10 games behind Texas. Kansas City entered 21-24, fourth place AL Central, 5 1/2 games behind Detroit. The pitchers: Angels, Billy Buckner, right hander (0-0, 0.00). Kansas City, Jeremy Guthrie, right hander (5-2, 3.49 ERA). The result: Angels 7, Kansas City 0. Summary: The Angels won their seventh straight and, for all their offense lately, they would have won this game without a hit. A week ago, the Angels didn't know who would start in this game, and they ended up with five pitchers combining for a four-hit shutout. There were two key at-bats for Buckner, and they both went his way. In the fourth, after Alcides Escobar led off with a single, Buckner immediately went 3-0 on Alex Gordon, Kansas City's best hitter (.337). Escobar had Buckner's attention and the pitcher's concentration was split between the pitcher and the hitter. Gordon swung at a pretty good candidate for ball four, a fastball down, and fouled it off. Then, Gordon fouled off a fastball right through the zone as Escobar ran. Next pitch, Escobar ran again and Gordon fouled off an offering a lot like the last one on 3-2. On the next pitch, a knee-high fastball over the plate, Gordon flied out to medium center field ... Turned out to be big. After Escobar stole on the first pitch to Billy Butler, Buckner pitched around Butler for a walk. Following that, Eric Hosmer hit a line drive right at second baseman Howie Kendrick, then Lorenzo Cain grounded into a force to end the inning. What now: The Angels now are 22-27, still third place in the AL West, and still 10 games behind Texas. But they have won seven games in a row. Last year, right at about this time (May 22-29), the Angels won eight straight games, rallying from an 18-25 start to reach 26-25. The streak narrowed their deficit to Texas in the AL West from eight games to 5 1/2 games ... Which just shows how much more poorly the Angels started this year. The present streak began when they were 15-27, 12 games behind Texas ... Kansas City has lost seven straight home games and 15 of their last 19 games overall ... The present run of 19 games began with the Royals down only one-half game in the AL Central at 17-10 through May 5. 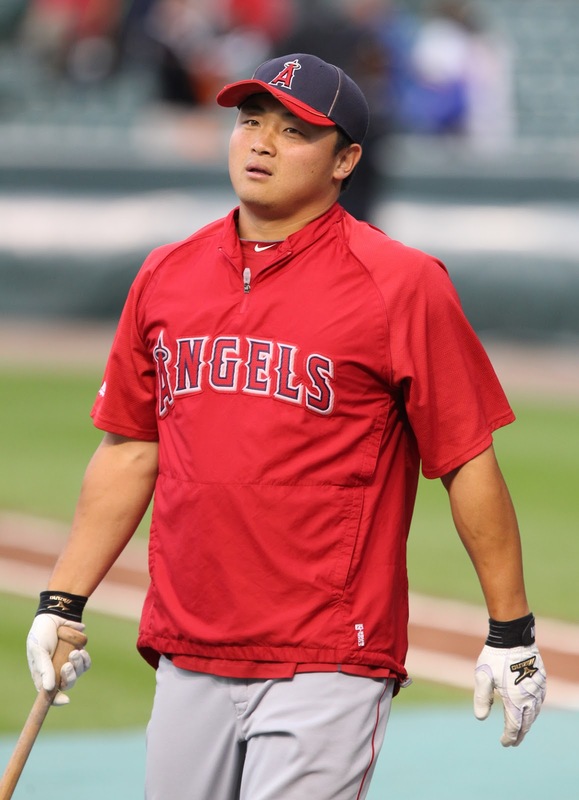 Next day, the Royals ran into -- ready for this, Angels fans? -- Chicago White Sox left hander Chris Sale. The Royals scored a run in the first against Sale, then Kansas City starter James Shields shut down the White Sox, allowing two hits and striking out nine through eight innings. In the ninth, Kansas City manager Ned Yost, brought in closer Greg Holland to protect the 1-0 lead. Royals fans have since then blamed Yost for making the pitching change, but that's not what cost the Royals the game. They just didn't make a play with two out. Second baseman Chris Getz fielded a ground ball behind second base, but he couldn't feed the shortstop for a force play that would have ended the game as the White Sox scored the tying run. It's been downhill ever since then for the Royals ... Last time the Angels lost a game, Sale beat them, 3-0, in Anaheim on May 17. Five days before then, Sale almost rang them up for a perfect game on a Sunday night, but settled for a one-hitter in a 3-0 victory. The White Sox aren't anywhere this season, but Sale is in the nightmares of the Angels and the Royals ... The Angels will go for the sweep in Kansas City Sunday (11:10 a.m. PDT). The Angels will send right hander Jerome Williams (3-1, 2.53) against Kansas City right hander Wade Davis (3-3, 5.91) ... In addition to everything else going right for the Angels these days, they're about to finish a four-game series in Kansas City without ever seeing Shields (2-5, 2.47).